The lady in the blue frame looks like Temperantia ... as it are 4 women, one might suspect, these are the 4 cardinal virtues. The woman in the red frame seems to have the same tool as in your picture ("Prudence-with-world, ironically from Ferrara"). 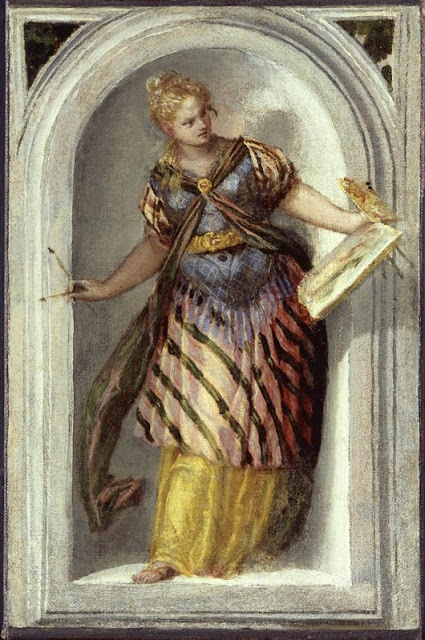 According to various descriptions of the painting they are said to represent Justice, Constancy, Clemency and Peace, as per the same four virtues in Strozzi's poem the Borsiad. But the Lady on the left seems to me to be temperance with the two jars, third from left has the sword and scales of Justice, the second with her club/mace could certainly be fortitude, and the one on the right could be prudence, if that is a compass she is holding. Well, there is some description of the triumphal festivities outside, which I don't know. Perhaps Ross knows more, he had studied these earlier, I remember. Anyway, the painter might have followed his own ideas, ignoring the complex plans of the Trionfi organisators. It's a pity, that we don't have other pictures of this event. It is a manuscript illustration of a poem by Gaspare Tribraco, "Divi ducis Borsii Estensis triumphus". "The humanist Gaspar de Tribraco 'Trimbocchi was born in Reggio Emilia in 1439, was a master of grammar at Modena and then the Este court where in 1458 he learned from Guarino Veronese and as a writer in 1466 read "poetry"; He was a friend of Boiardo and Strozzi; perhaps he died in Mantua in 1493 and left in addition to this Triumph of Borso, several poems and Satire. Tribraco wrote the text in 1463, when Borso was about the crusade that ended with altarpiece with the death of Pius II. A Borso course Tribraco dedicated the poem in hexameters, whose theme is the triumph of the Duke and the exaltation of his virtues including especially liberality. The decoration, in the past generally refers to an illuminator near George of Alemagna, was recently assigned to the hand of Bartholomew of Dyer, an artist working in Bologna, but also to Ferrara. The decoration consists of a frieze whose characters refer to the miniature flourished under Borso, while the cartoon takes the iconography of the triumphs which spread mainly through the illustration of illuminated manuscripts of Francesco Petrarca: in particular the model for the Triumph of Borso of c.1r has its prototype in "Triumphs" ms. 141 Library Casanatense Rome made for the family Zambeccari Bologna by the same miniaturist. The theme here is Petrarch interpreted in a sign courteous and everything for the exaltation of the Duke of Ferrara." ... again with this specific tool [sorry, my error, I detected later, that these are tools for painting ... :-( ... :-)]. 1557 in the possession of Emperor Charles V.
For the last card marked '21).' it seems to spell:- "El modo cioe dio padre"
Which by my reckoning translates to "The Way (i.e. Father God)"
I wonder if anyone here has any thoughts on this? So not 'The World'... but 'The Way' and that's God's way. Looking back at some of the oldest examples of this card we see angels or cherups, the divine hands of God, holding up emblematic pictures of 'The Way' - idyllic scenes of tranquility and safety. This scene of 'The Way', sometimes held up above the head or pointed to below was presented as a picture often on a round canvass. ..a round canvass that was later to morph into the World and to be stood on by figures that were now less angelic. Personally I have thought about this for many years and I see 'The Way' in it's deepest representation as The Creation. Yah establishes!